I did not see the tea lights until my arrival in Florida. My Mom loves the beauty of crystals. This was the perfect keepsake for guests at her surprise 80th birthday party. The extras were used to partially frame the place card table. They added the twinkle to a memorable evening! The mini crystal tealights were perfect in clusters on table top mirrors at our club's anniversary dinner. I also used them as sentimental keepsake/thankyou for planning committee members. Just the right size and price. They would make classy table favors. Went along with the "Theme" of Sparkle, bling and shabby chic! Guests loved taking them home! 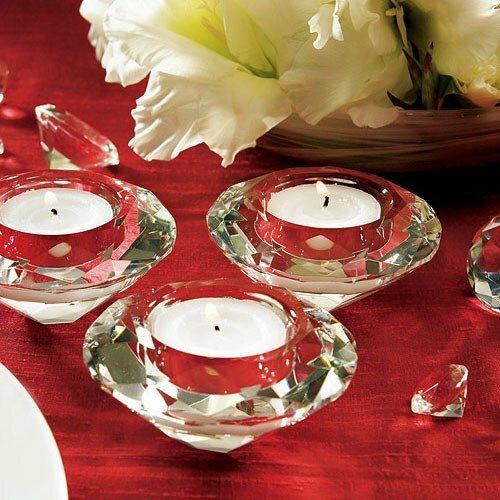 Plan to use these beautiful faceted tea light holders as wedding table decorations. They will add sparkle without taking up space. Nice product packaging as well! I bought an extra box to decorate my holiday table! Great "bling" for any table! These wonderful candle holders added sparkle and glam, not to mention romance, to the table settings for our son's wedding! goes well with our theme! i love these diamond tea light holders! goes well with our crystals and diamonds theme! i plan on ordering more of them! I will be placing these on the tables at my daughter's engagement party. Also ordered the personalized red rose petals to scatter around the tables. Everything is so pretty! I used them as favors at my wedding, and everyone loved them. Used these crystal tealight holders on wedding shower tables surrounding a floral centerpiece...scattered "Beaucoup" diamonds and silk pedals for an unbelievably professional, affordable "look". Amazing quality...I was actually wonderfully surprised! We placed these around the centerpiece on the tables at the reception. They are high quality and provided a romantic and tasteful table flair. These are great for dressing up your dining room table. Use clear-cup tealights, and get candles that coordinate with your theme colors like red tealights for Christmas, etc. I also went to a craft store and got some diamond shaped thingies to scatter around the table top as well. Makes your table look like a million bucks! A better than expected, high quality product. I absolutely love them. Q:Would a tealight that is white with a silver rim look ok, or a gold rim tealight? A:Personally, I think that either would look OK. If diamonds are a girl's best friend, these sparkling crystal diamond tealights are a girl's best wedding decoration. Also great as bridal shower favors, engagement party favors, or as favors for any event that needs a little extra sparkle. Simply slip a tealight in each candleholder, nestle in a bed of rose petals and let these small sensations light up the night. Each diamond-shaped tealight holder is made of glamorous multi-faceted glass crystal and measures 1.5"H, 3.13" diameter. Sold in sets of six. Keep diamonds in the details with diamond ring napkin holders and tall, diamond shaped tealight holders.